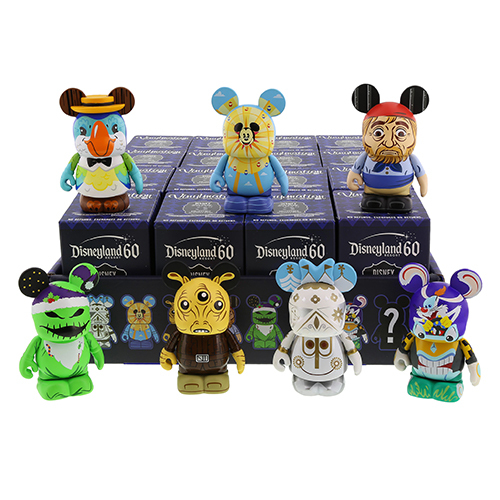 A new Vinylmation Collection was released at Disneyland D-Street today, July 17th 2015. It is in celebration of Disneyland's 60th Anniversary. The collection is based on rides featured around the Disneyland park - It's A Small World (as a Minnie Mouse shaped Vinylmation), Mickey's Fun Wheel, Ree Yees representing Star Tours, a pirate for Pirates of the Caribbean, Oogie Boogie representing Haunted Mansion Holiday, José from the Enchanted Tiki Room, and Roger, Benny the Cab and Jessica Rabbit representing Roger Rabbit's Car Toon Spin. There is a mystery Vinylmation in the series which was revealed to be Henry from Disneyland’s Country Bear Vacation Hoedown. There are also other variants - Small World Holiday, and Mickey's Fun Wheel with a Sun. 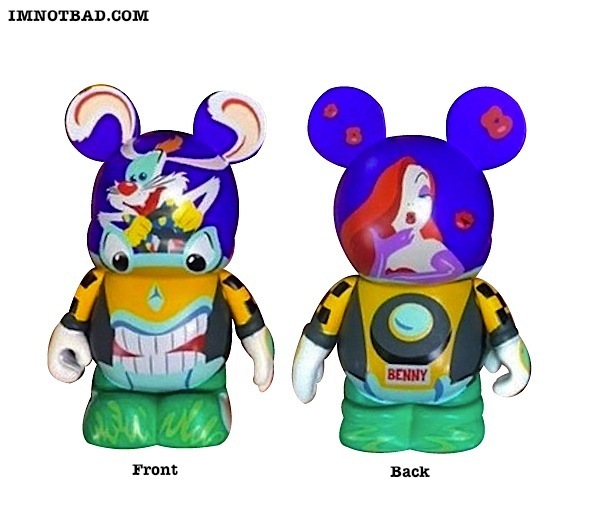 The Roger Rabbit's Car Toon Spin Vinylmation is Mickey Mouse shaped. The background is dark blue. Roger is out of a spin with Benny the Cab, as they appear in the ride. Benny has a worried look on his face as they become surrounded by The Dip. Roger is behind the wheel and his ears are painted onto the Mickey ear shapes. Jessica Rabbit is on the reverse side. She is sitting and sending out a kiss. There are several lips fluttering around and on the Mickey ear shapes. As with all collections, this will be a blind box assortment, so you will not know which characters you will get. They sell for $16.95 each. Some collections do become available on Disney's website, but as of right now these can only be found in Disneyland. You can find our more by visiting Disney's Merchandise Blog. Thanks to Mark for the photos and finding that Jessica is now part of the collection!